With core CPI printing at a frothy 2.4%, and the Fed's preferred inflation metric, core PCE finally hitting the Fed's 2.0% bogey for the first time since 2012, inflation watchers are confused why Jerome Powell's recent Jackson Hole speech was surprisingly dovish even as inflation threatens to ramp higher in a time of protectionism and tariffs threatening to push prices even higher. But the biggest concern from an inflation "basket" standpoint has little to do with Trump's trade war, and everything to do with shelter costs, and especially rent, the single biggest contributor to the Fed's inflation calculation. It's a concern because according to the latest report from RentCafe and Yardi Matrix, which compiles data from actual rents charged in the 252 largest US cities, fewer than expected apartment deliveries this year increased competition among existing units, pushing up the national average rent by another 3.1% - the highest monthly increase in 18 months - to $1,412 in August, an all time high. 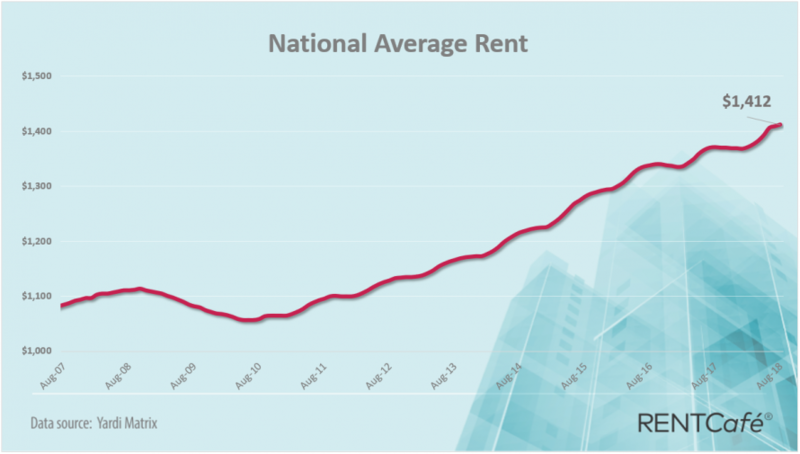 The national average monthly rent swelled by $42 since last August and $2 since last month. Above-average numbers of renters renewing leases at the end of the summer and heightened demand from college-age renters also contributed to the rise in rents this time of year. The rental market is so hot right now - perhaps a continue sign that most Americans remain priced out of purchasing a home - that rents increased in 89% of the nation’s biggest 252 cities in August, stayed flat in 10% of cities, and dropped in only 1% of cities compared to August 2017. Queens (NYC), Las Vegas, and Phoenix rents increased the most in one year, while Baltimore, San Antonio, and Washington, DC rents have changed the least among the nation’s largest cities. Renter Mega-Hubs: The largest increases were in Orlando (7.7%) and Phoenix (6.8%), while Manhattan (1.9%) and Washington, D.C. (2.1%) saw some of the slowest growing rents in this category. The biggest net changes were felt by renters in Los Angeles, which pay $102 more per month this August compared to last year. Large cities: Rents in Queens and Charlotte surge by 8.4% and 5.2% respectively, but barely move in Baltimore (0.2%) and San Antonio (1.5%). 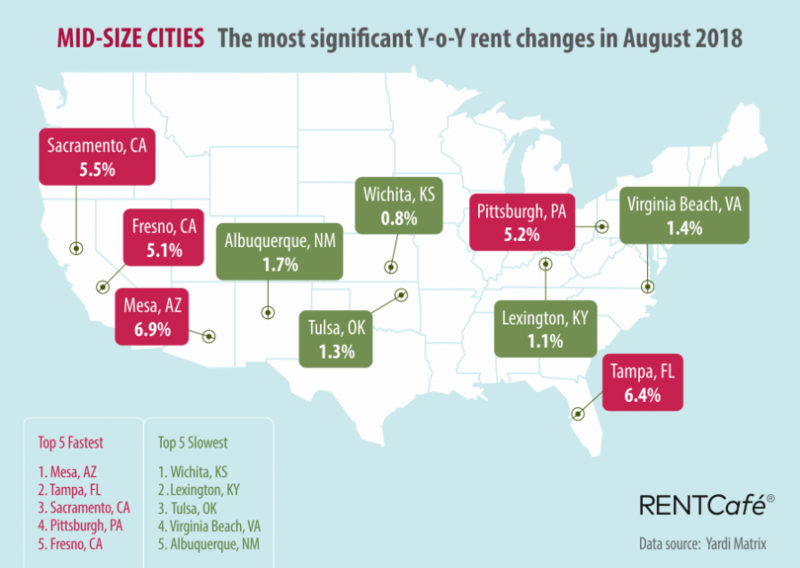 Mid-size cities: Mesa (6.9%), Tampa (6.4%), and Sacramento (5.5%) rents increase at the fastest pace. At the other end of the spectrum, rents only ticked up in Virginia Beach (1.4%) and Albuquerque (1.7%). Small cities: Due to limited stock and high demand, Lancaster and Reno rents soared by 9.7% and 11.3% respectively. Apartment prices in Midland (31.9%) and Odessa (30%) are over $300 per month more expensive than in August 2017. Brownsville (-2%) and Baton Rouge (-0.7%) saw rents decrease over the past year. Of the top 20 largest renter hubs in the U.S., Orlando apartments are seeing the highest increase in rent over the past year, 7.7%, reaching $1,393 in August, while San Antonio apartments saw the weakest rent growth of the 20 cities, 1.5% in one year, posting an average rent of $996 per month in August. 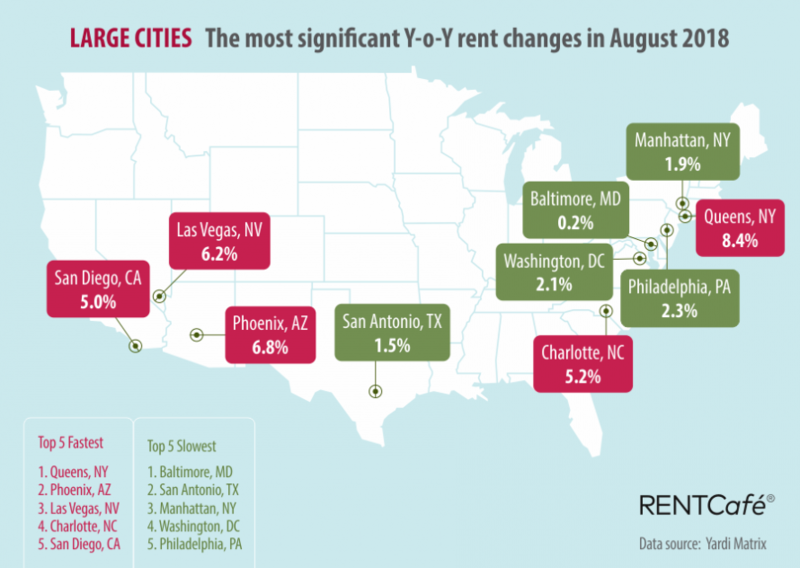 The biggest net changes in rent compared to August 2017 were felt by renters in Los Angeles, who are paying on average $102 per month more this August compared to the same month last year. 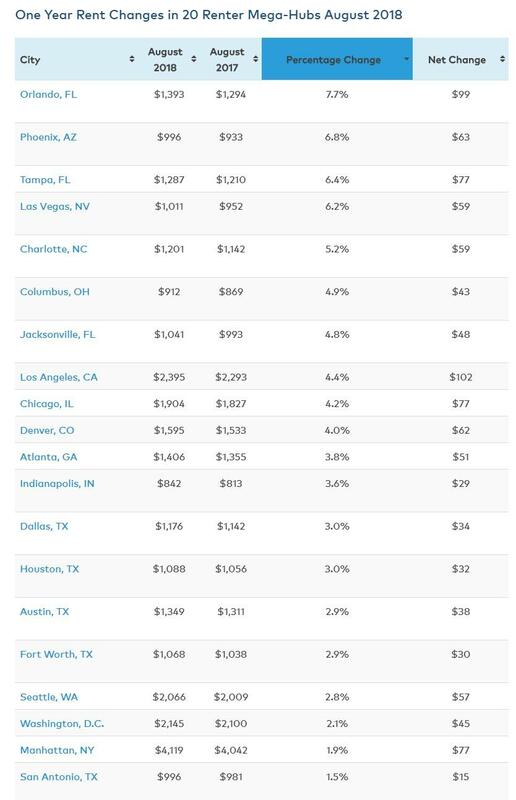 Orlando rents increased by no less than $99 per month, and Tampa, Chicago, and Manhattan (New York City) rents are $77 above last year’s average. At the opposite end, rents in San Antonio saw the smallest uptick, only $15 more per month than they were one year ago. Housing in the Permian Basin continues to see the steepest price increases in the country. Apartments for rent in Midland, TX now cost $1,595 per month, a 31.9% leap from one year prior. Likewise, rentals in neighboring Odessa, TX cost $1,365 on average, having jumped 30% in one year. Reno, NV‘s housing crunch is worsening due to limited land development and high demand for rentals. Rents in Reno are the third fastest rising in the country, behind only Midland and Odessa. The average rent in Reno is $1,253 per month, a massive 11.3% increase year over year, or $127 more per month compared to the same time last year. The average rent in Reno was around $900 just three years ago but has jumped by more than $300 in 36 months, making it increasingly unaffordable for renters. Nevada’s growing popularity as a destination for those moving out of California is reflected in rapidly-growing real estate prices. Besides Reno, apartments in Las Vegas are also getting expensive, with the third fastest growing rents in the U.S. compared to other large cities. Peoria, AZ is facing a similar situation. What used to be an affordable town in the Phoenix area, with an average rent of about $900 per month no more than three years ago, now has apartments that go for $1,114 per month on average, over $200 more expensive, a big leap and a heavy burden for the area’s renters. Compared to August 2017, the average rent in Peoria is 10.1% or $102/month more expensive, the fourth fastest growing this August out of 252 cities surveyed. Likewise, rents in other parts of the Phoenix metro are also rising faster than most other parts of the country, as a consequence of strong demand boosted by big increases in population. Lancaster, CA is fifth in the U.S. in terms of fastest-growing rents. The average rent in Lancaster shot up 9.7% year over year, reaching $1,274 per month. The likely reason? Not enough apartments are being built to keep up with the surge in renter population in this town located on the northern fringes of Los Angeles County. 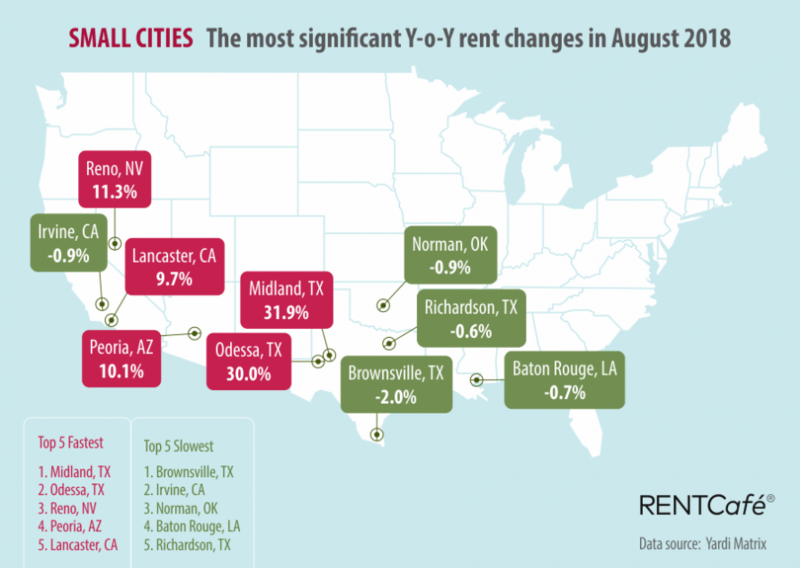 On the other end of the national spectrum, rent prices have decreased in August in border town Brownsville, TX (-2% y-o-y), Orange County’s Irvine, CA (-0.9% y-o-y), Norman, OK (-0.9% y-o-y), Baton Rouge, LA (-0.7%) and Dallas suburb Richardson, TX (-0.6%). Amarillo, TX, New Haven, CT, Baltimore, MD, Frisco, TX and Stamford, CT round up the 10 slowest growing rent prices in the U.S. in August. Step aside Brooklyn: rent prices are now racing in the NYC borough of Queens, up 8.4% compared to last year, with an average rent of $2,342, behind Manhattan’s average rent of $4,119 and Brooklyn’s $2,801. Rents in Manhattan are among the slowest growing in the U.S., 1.9%, while in Brooklyn rents were up 3.9%. The second fastest growing rents among the nation’s largest cities are in Phoenix, AZ, up 6.8% over the year. The area has seen a surge in population in search of affordable housing and job opportunities. Even with prices of apartments growing at annual rates of 6-7%, the average rent is still affordable at $996 per month, especially when compared to most other major cities in the country. Las Vegas is an increasingly popular place to move to, as Census population estimates show, but the local real estate market is slow to respond. New apartment construction is low, causing rents to go up significantly. An apartment in Las Vegas costs on average $1,011, up 6.2% since August 2017. At the same time, rents decreased in August in border town Brownsville, TX (-2% y-o-y), Orange County’s Irvine, CA (-0.9% y-o-y), Norman, OK (-0.9% y-o-y), Baton Rouge, LA (-0.7%) and Dallas suburb Richardson, TX (-0.6%). 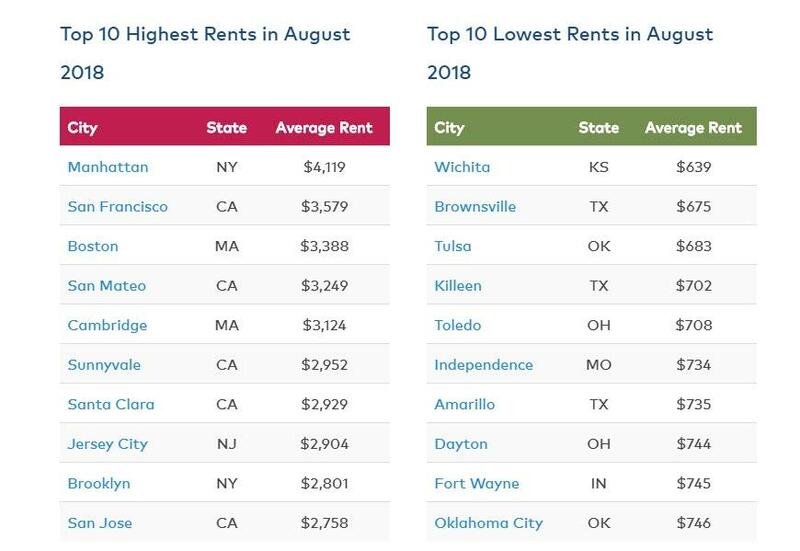 Amarillo, TX, New Haven, CT, Baltimore, MD, Frisco, TX and Stamford, CT round up the 10 slowest growing rent prices in the U.S. in August. Apartments in Mesa, AZ and Tampa, FL are seeing price increases above 6% in August. Rents in Mesa reached $965 per month, and in Tampa the average rent is $1,287. Sacramento, Pittsburgh, and Fresno wrap up the top 5, with annual price increases of above 5%. Pittsburgh, PA is emerging as a hot rental market, as the city’s job market is gaining traction in tech-related fields. The average rent in Steel City is $1,216, but it is expected to keep growing as apartment construction is not yet in line with the sudden increase in demand. At the other end of the chart are Wichita, KS, with rents decreasing by 0.8%, Lexington, KY, where prices for apartments moved by 1.1% in one year, Tulsa, OK, where rents changed by 1.3%, Virginia Beach, with prices up by only 1.4% and Albuquerque, NM, where rents saw a 1.7% uptick. The average rent in Lexington sits at $889 per month, in Virginia Beach it is slightly higher, at $1,169 per month, and in Albuquerque, it averages $852 per month. The most fluctuating prices are in small cities at both ends of the list. The top 20 list of highest annual rent increases is dominated by small cities (17 out of 20). Midland and Odessa, however, stand out from the rest of them, with annual percentage increases of over 30%, which translate into an additional $300 or more per month to the average rent check. The region is economically centered around the shale/oil industry and it’s booming, and real estate prices are taking off as well. In terms of absolute prices, the top cities with the 10 highest rents in the country remains unchanged. Manhattan is still the most expensive, with apartment rents at $4,119, San Francisco is second, with an average rent of $3,579, and Boston is third, with an average rent of $3,388. San Mateo, CA and Cambridge, MA also have an average rent above $3,000 per month. The cheapest rents of the 252 cities surveyed are in Wichita, Brownsville, and Tulsa, all below $700 per month. According to RentCafe, much of the change in rent prices we see this year is driven by how much demand there is in a specific area and what that area does to deal with it. However, the underlying factors are more complex. The housing market continues to change as a result of the 2007 subprime crisis, according to Doug Ressler, Director of Business Intelligence at Yardi Matrix. Furthermore, markets are undergoing a significant change driven by dramatically different demographic trends. Trends vary by market and will be impacted by population aging, population growth, immigration and home ownership trends, says Ressler. Naturally, they will also be impacted by the state of the economy, the Fed's monetary policy and the level of the capital markets. However, should the current rental surge continue, the Fed will have no choice but to hike rates far higher than the general market consensus expects, especially following Powell's "dovish" Jackson Hole speech.